The Mueller Team worked closely with the architect and church building committee to establish a design that allowed the church to maximize its’ return on investment. Our team assisted in designing/building a facility that exceeded the church’s expectations relevant to cost, function, quality and aesthetic appeal. Al J. Mueller Construction Company erected the Tedd Cycle facility for its’ original occupant, Essex Wire. 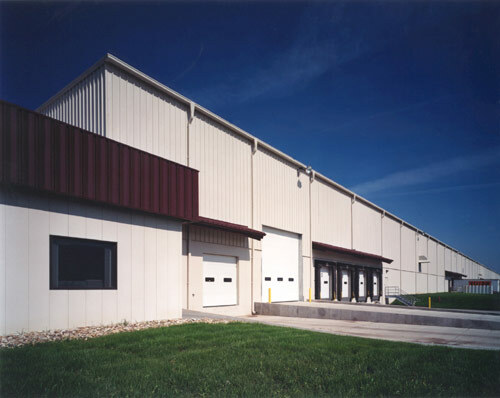 The 150,000 sf distribution structure was built using tilt-wall and steel construction in St. Joseph’s aggressive Mitchell Woods Business Park. 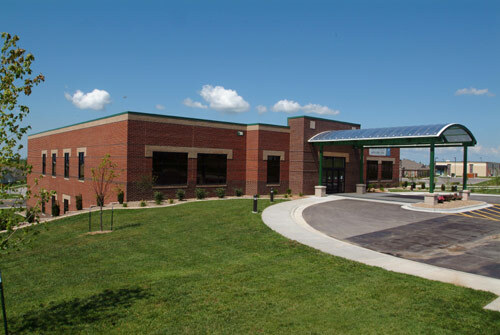 Al J. Mueller Construction Company provided architectural, structural, civil, plumbing and electrical design/build services for the completion of this project. 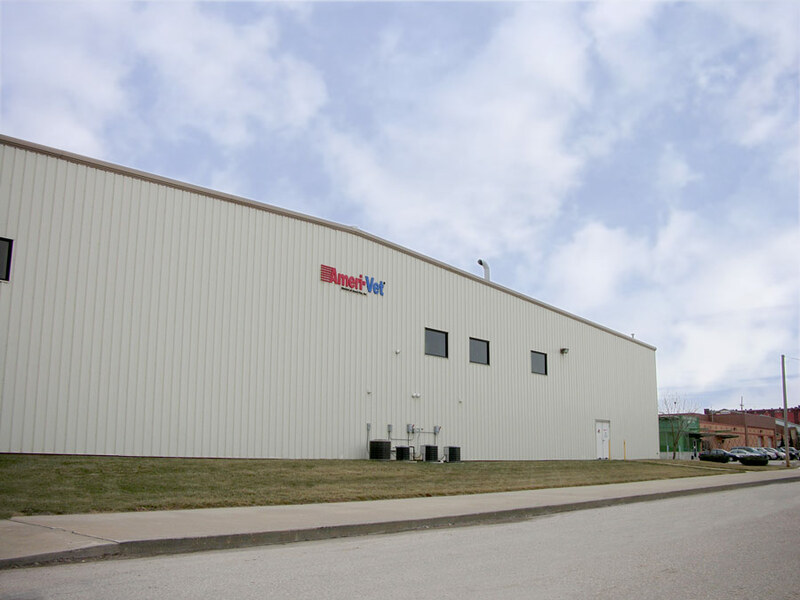 The Mueller Team has completed four projects for the firm including facilities in Joplin, MO, St. Joseph, MO, Kingman, AZ and most recently in Edwardsville, KS. 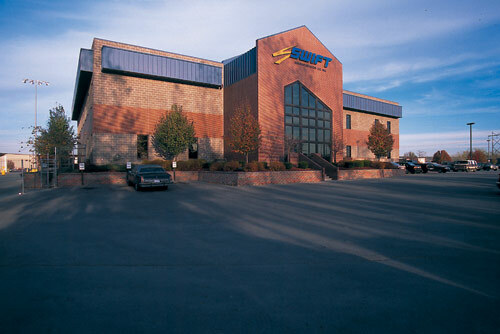 This three building project included a 30,000 sf office, 28,000 sf maintenance facility and a 2,700 sf wash building. St. Joseph’s Pony Express Motel was developed during the 1940s near a traffic intersection that through the years has become the most traveled intersection in town. While the popularity of the Pony Express Motel had “gone west,” the property’s location continued to hold great promise. 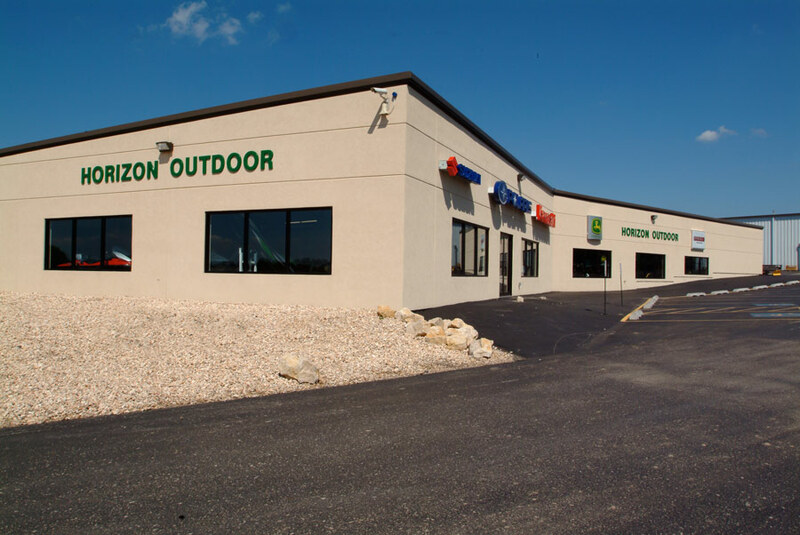 Al J. Mueller Construction was called upon to build the new 5 acre, 43,000 SF Pony Express Plaza. While this new development offers the benefits of contemporary construction and technology, the architectural design is vintage in nature and adds to the classic landscape for which St. Joseph is known. Mueller’s final product introduces the Pony Express to the 21st century. 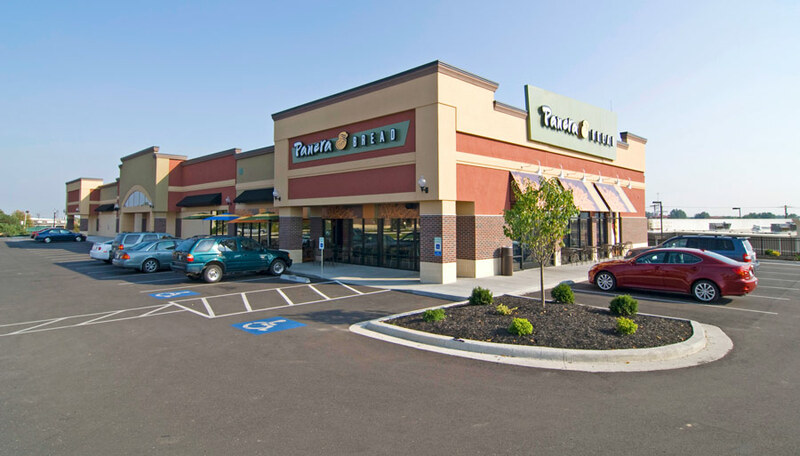 The Pony Express Plaza houses tenants UMB Bank, Blue Cross Blue Shield, Spine & Sport Physical Therapy, Quizno’s, On Site Golf, Anytime Fitness and Panera Bread. 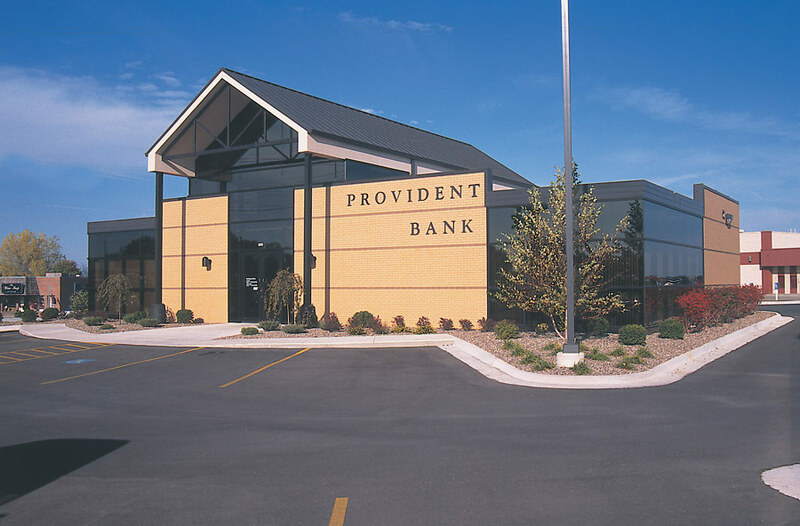 Progressive Moulded Products, Inc. established its’ Midwest Division of the Canadian plastic manufacturing firm in a 72,000 sf industrial facility built by Al J. Mueller Construction Co. in 2003. 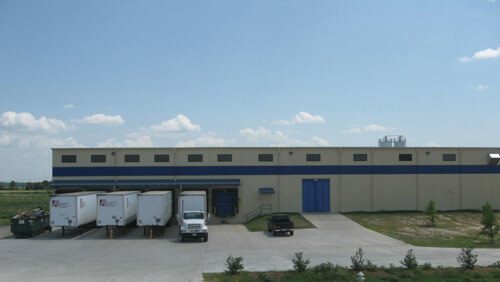 Upon identifying the speculative facility, PMP asked Mueller to complete necessary tenant improvement/interior finish including a 12,000 sf immediate addition to the facility, installation of a crane system, pouring additional footings for injection moulding equipment, a complete interior epoxy floor, and a 7,000 sf administrative office. 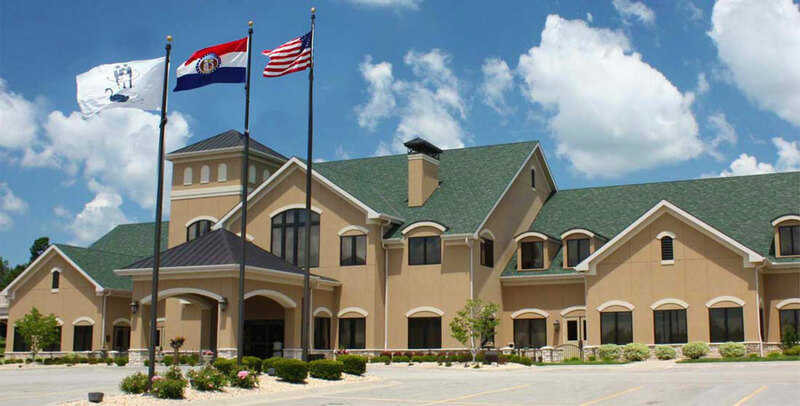 Al J. Mueller Construction Co. provided architectural, structural, civil, plumbing and electrical design/build services in conjunction with trusted architects and engineers. 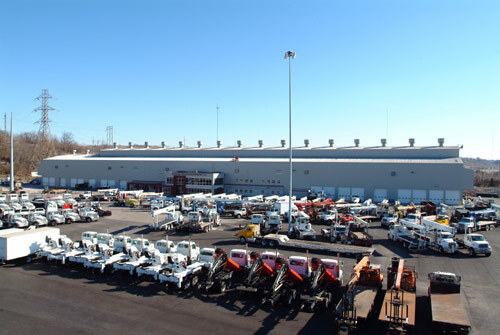 This 380,000 sf distribution project was a joint venture between Al J. Mueller Construction Company and BUCON (Butler Construction Group). The AJM team completed concrete, steel tilt-wall and the office interior finish. The project strategy was unique as both ends of the 900 foot long facility were commissioned independently to allow construction to meet and tie in steel at the facility’s mid-point. 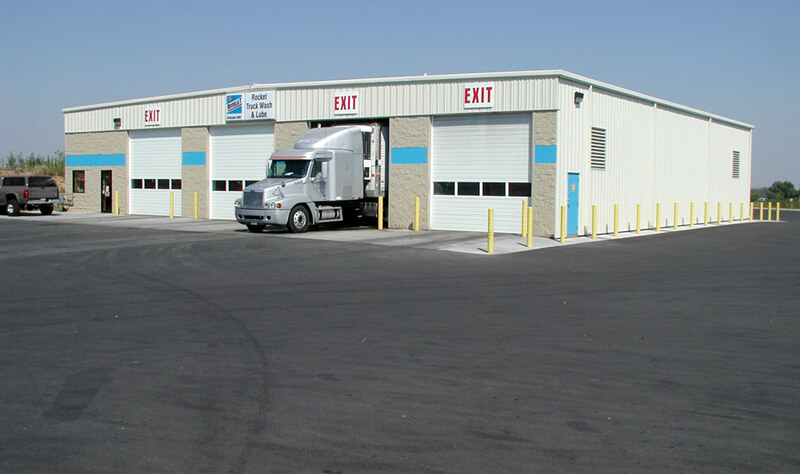 This recently completed 34,000 sf facility features eight truck bays and several acres of parking for KCR’s sales and maintenance operations. The project was a new design for the firm and required extensive interaction between AJM and City officials for approval of the overhead ducted exhaust system. AJM is currently discussing additional projects with KCR. 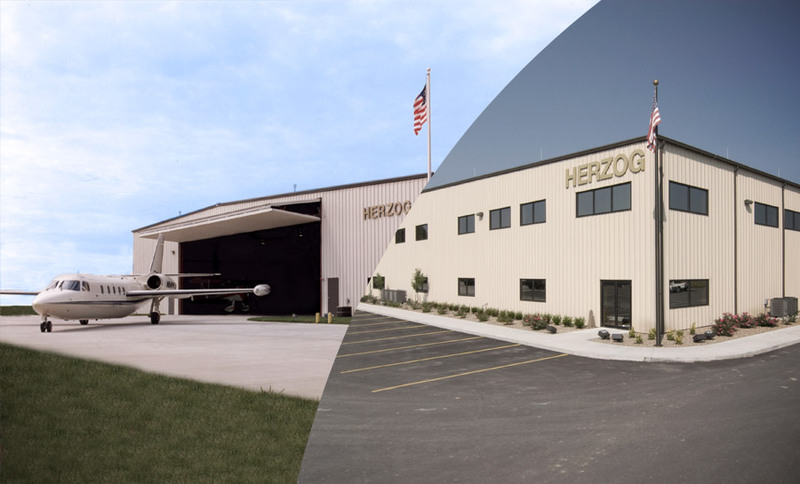 Al J. Mueller Construction Co. was commissioned by Herzog Contracting Corp. to design and build its’ centerpiece jet hangar in 1993. The state-of-the-art hangar consists of a 17,000 square foot parking/maintenance floor, RV Bay, pilot offices and an upstairs lounge featuring full kitchen amenities. The hangar features two bi-folding hangar doors designed to ease the task of parking and removing aircraft from the facility. 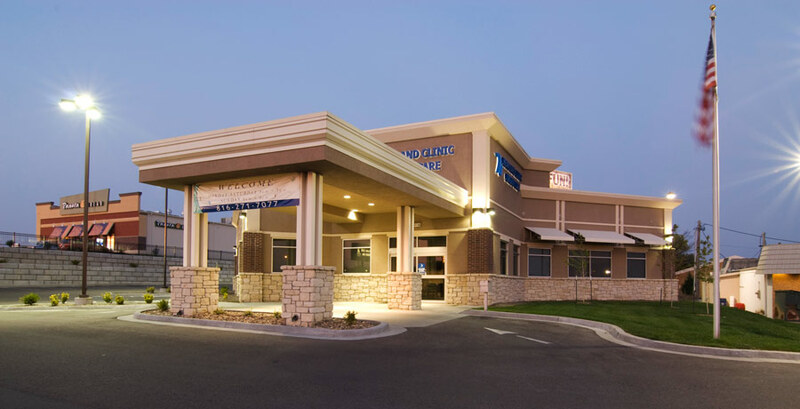 The 24,000 square foot medical office building offers 12,000 square feet of upper level primary care that serves the surrounding Platte City area. The remaining 12,000 square feet will be completed at a later date to accommodate future services and community needs.Primary care services including internal medicine, pediatrics and family care are currently available at the clinic and utilize 23 examination rooms. Technical services such as radiology and laboratory services are provided in the facility for the convenience of its patients. Heartland will also host specialists – including cardiologists and orthopedic physicians – weekly to serve clients requiring such care. Al J. Mueller Construction Company was engaged as the design/builder for this community serving project based on their strong commitment to excellence. The new clinic changes the landscape at one of the busiest intersections in St. Joseph. A shuttered Hardees restaurant occupied the site before the demolition began on September 16th; 75 days later the facility was fully staffed and seeing it’s first patient. With the help of an outstanding group of subcontractors, the Mueller team was able to turn over the facility to Heartland more than two weeks earlier than expected. Project Manager, Brett Hausman, said the project required some long work days and lots of coordination of subcontractors. 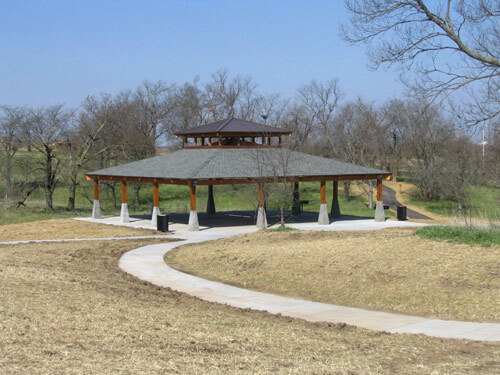 Al J. Mueller Construction Co. provided architectural, structural, civil, plumbing and electrical design/build services. This 8.600 sf office project was completed by Al J. Mueller Construction Company with an extreme focus on aesthetic quality. 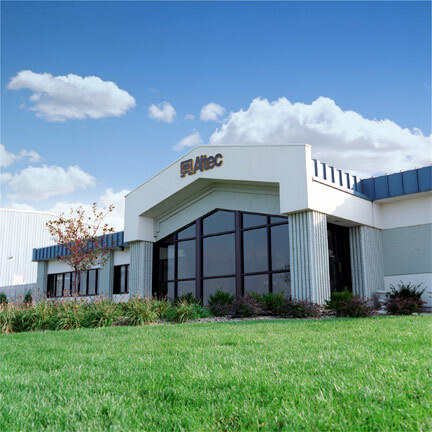 The building provided numerous open engineering offices for Altec’s growing management team. As the facility was to be frequently utilized for presentations and meetings, Al J. Mueller Construction utilized sound masking materials for the building’s interior to dampen the numerous speakers and receivers used during such presentations. The facility also required an ample amount of glasswork to provide the space with natural lighting. 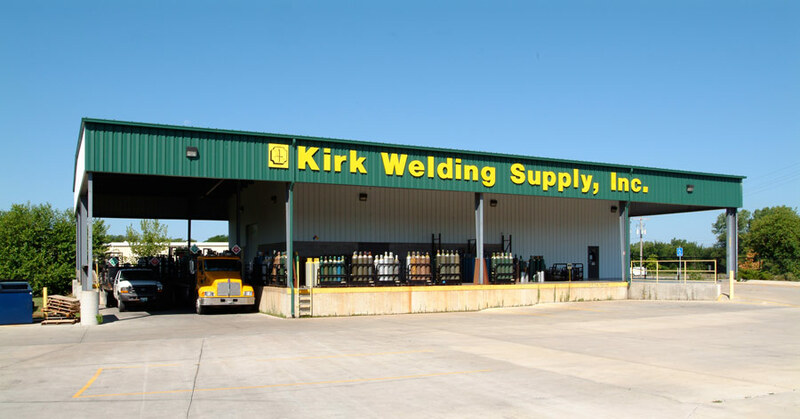 The exterior of the pre-engineered metal building was completing utilizing an E.F.I.S. wall-system and a standing seam roof. With a growing congregation, the decision was made to move from their century old multi-story facility to a modern one- story campus. Mueller was able to incorporate the stained glass from their existing facility into the design of the new church. By adding a gymnasium and full kitchen, the church was able to cultivate a new and vibrant membership. Mueller was able to control costs and partnered with several church members for construction. 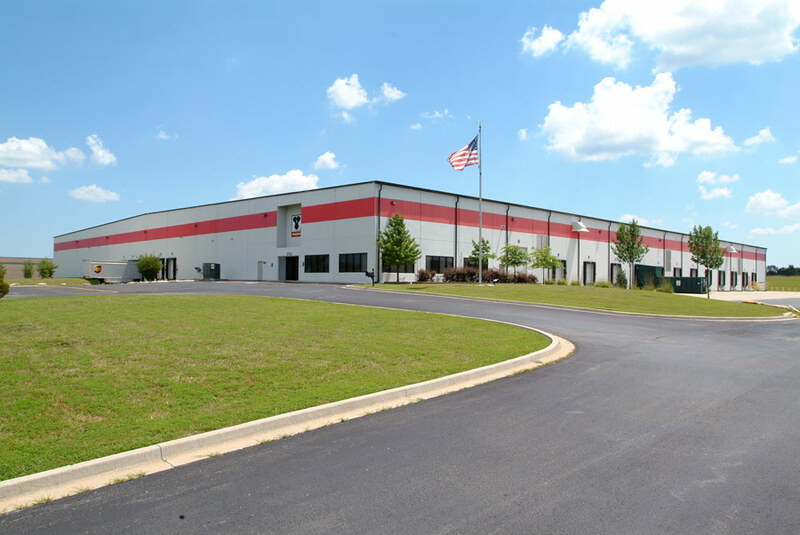 This 57,000 sf facility was erected for Altec Industries in 2000 to provide the firm with additional necessary space for the growing firm. A new 15,000 sf sales office and showroom featuring Altec’s original aerial truck utilizes much of the lower level. The remainder of the facility allows for additional production/operation/shop space and a lunch room for the employees in the facility. 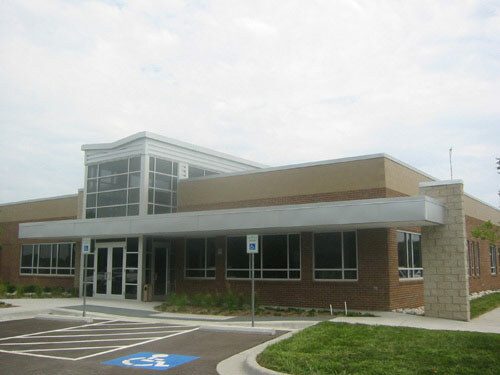 Al J. Mueller Construction Company provided architectural, structural, civil, plumbing and electrical design/build services for the completion of this project. 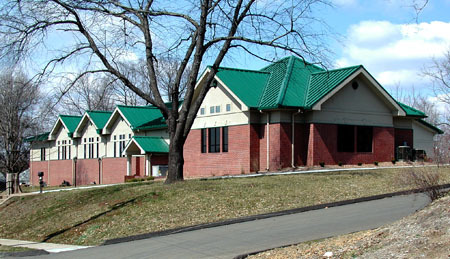 Meierhoffer’s 36,000 square foot 21st Century funeral center offers multiple chapels, a crematory, a community reception room and other services. 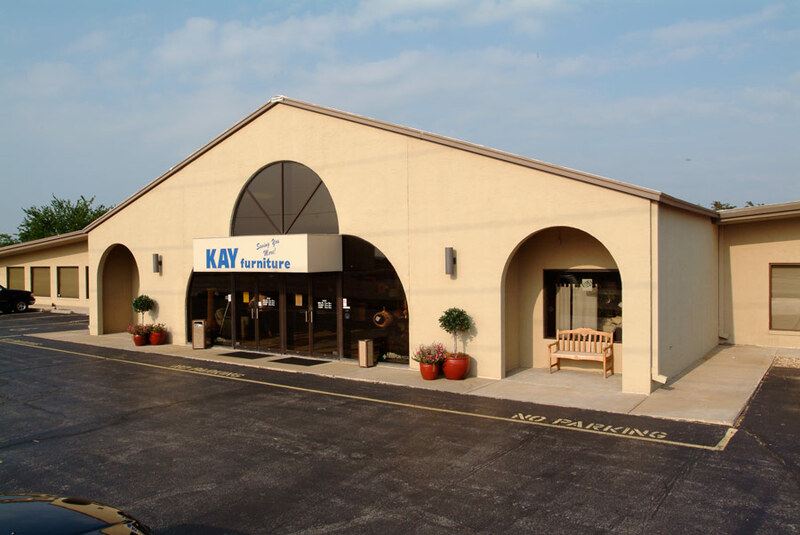 This spacious state-of-the-art facility brings all aspects of funeral, cremation and cemetery service together at one location. 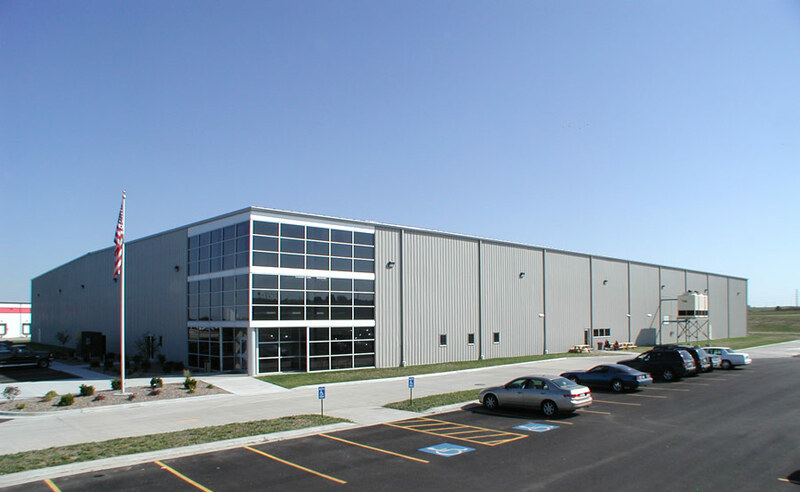 Al J. Mueller Construction utilized conventional steel and metal truss construction to assure this project well represents the 5th generation of Meierhoffer’s strong commitment to the people of St. Joseph. © 2019 Al J. Mueller Construction Company, St Joseph, Missouri. All Rights Reserved.